Welcome to my brand new mini series: "The 6 Steps to being radically organised in your business." If we haven’t met before, I'm Stephanie Holland, strategist and mentor at StephanieHolland.Co where I help ambitious humans launch their ideas with more ease, vision and success. I LOVE helping you to minimise the pain, drama and burnout of launching your ideas, AND stabilising the rollercoaster of starting up. And when I say I developed it for myself, it was at a pretty low point for me, very quickly after rebranding and repositioning as a coach after success as a consultant. Within 3 months of starting my startup coaching practice in 2014 I felt paralyzed by overwhelm and my work came to a standstill. My to-do list was as insatiable, I was working every waking hour, getting caught up in the busyness of the day to day, and stuck down the rabbit hole of endless online business training that promising to grow my list and get me to six figures in as many months. I felt incompetent and incapable of moving forward. I was no longer aligned with the vision I had for my life and life’s work. "If you don't know where you’re going, any road will get you there." I had to create a vision for my life that excited the crap out of me, and THAT would help me get organised - radically organised - in my day to day, both in my life AND in my work. What do I mean by this? Well, let’s dive into the 6 steps and take a look! The first step is creating a big picture vision for your life that excites the crap out of you. ... so you have an unstoppable driving force for your life and work. This is the most strategic resource for your business because it gives you a powerful decision making framework for how you spend your time, what kind of business you create, the types of products & services you create, and how you package, market & sell your offers. It radically shifts the way you show up for your work, because the ultimate result at the end of the tunnel is YOUR LIFE! Not just a paycheck! It means your life vision helps you create a powerful business model, strategy and plan. When you have these in place you can focus on what matters most. You won’t waste time creating projects, services, products & offers that don’t align with how you want to live. You’ll be laser focused on building a business that supports the life you WANT. ... if you want to be location independent, you’ll probably think twice about building a one-on-one coaching practice to ties you to certain schedules and time zones. So that affects your business model & your products & services. If you want to live in Central America like I do for several months of the year, you’ll start a podcast instead of a FB live streaming show, because the internet here is really unpredictable. So that affects your marketing & communications. Creating a vision for your life that excites the crap out of you! Because being radically organised is knowing what matters most. 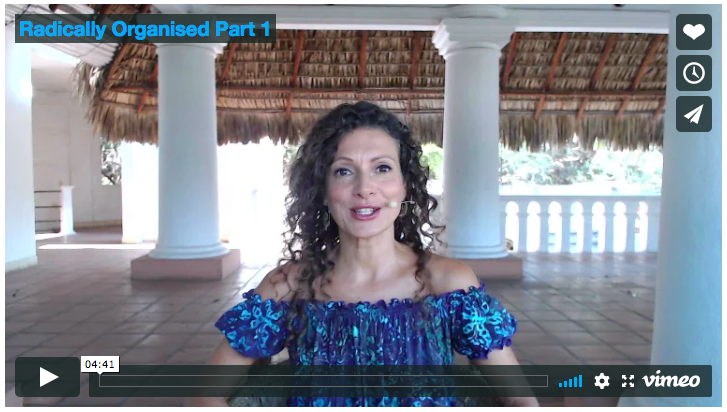 Join me in Part 2 where I walk you through steps 2-6 for becoming radically organised in your business!